Sun Six betting tips and predictions! Play for free, win £1 million! Sun Six is the brand new millionaire game powered by SunBets! You can win £1 million jackpot - just by picking the correct score of six games this weekend. Find here our SunBets Sun Six predictions and betting tips for this weekend's matches! Every week, SunBets pick out six matches from the Premier League and beyond. And all you have to do to be in with a shot of landing the £1million jackpot is correctly guess the correct score of all six selected games. Find below our predictions! 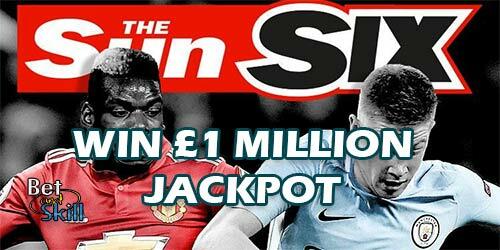 Copy and win a million with Sun Six - the new predictor game from The Sun. Still not registered with SunBets? Click here and open a new account for free! How to claim a FREE £30 bet at SunBets?? "Sun Six betting tips and predictions! Play for free, win £1 million!"